Hey, how was your weekend? Mine was another busy, but fun one. The highlights were shopping and food trucks, so I'm certainly not complaining. Anyway, for all the running around I've been doing lately, you won't catch me in a pair of uncomfortable shoes. I’ve been wearing my white Converse sneakers like crazy lately, because they’re cute, comfortable, and perfect for spring and summer. 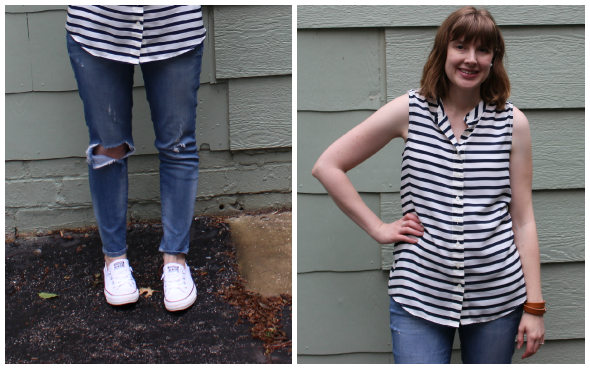 Last week I featured my chambray dress all week, but this week it’s all about my Converse sneakers. Today I paired them with my favorite ripped up jeans and classic stripes. This modern classic combination is probably my most-worn formula for Converse sneakers; I love how they look paired with classic stripes and something more modern, like these jeans. What are your go-to “running around” shoes? Linking to Mix it Mondays, Mingle Monday, Monday Mingle, and Let it Shine. 5 years ago: summer-izing my LBD. 4 years ago: wearing cool blues and white. 3 years ago: adding a light layer to a favorite summer dress.